US First Lady Melania Trump has eschewed Muslim tradition by electing not to wear a headscarf on an official visit to Saudi Arabia – this despite her husband’s very public criticism of Michelle Obama for making the same choice two years ago. 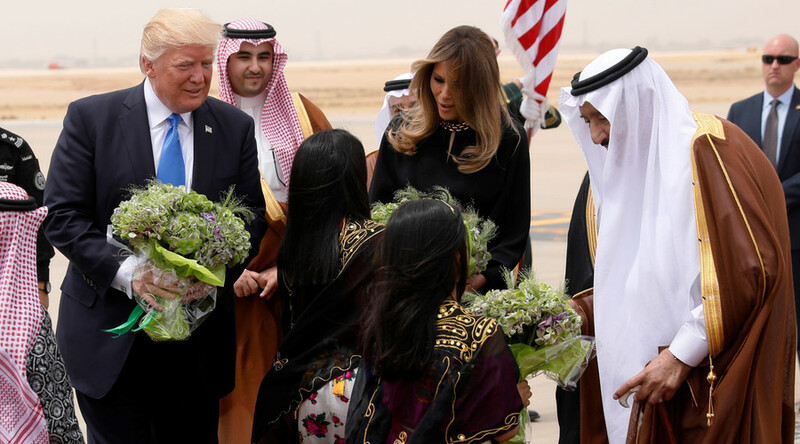 Donald and Melania Trump met Saudi King Salman bin Abdulaziz al-Saud in Riyadh on Saturday after stepping off Air Force One for the president’s first overseas trip since taking office. Greeted by Saudi officials alongside her husband, the First Lady wore a long black dress, similar to an abaya in style, but did not don a headscarf. Saudi Arabian law states that women should wear conservative clothing including a full-length abaya cloak, while Muslim females are often clothed in a head dress. Religious police enforce the Saudi Arabian dress code and the UK foreign office advises visitors to carry a scarf with them in case they are asked to cover their heads. According to US Department of State, women who refuse to cover their heads “risk confrontation” with or arrest by the Mutawwa, the religious police. In 2015, Donald Trump criticized then-First Lady Michelle Obama for not wearing a headscarf while in Saudi Arabia, a move Trump suggested could provoke “enemies” of the US. Melania Trump joins a growing list of women leaders and first ladies who have decided against covering their head while in the Arab nation. In April, German Chancellor Angela Merkel met the Saudi king without wearing any type of head garb. It followed a visit by UK Prime Minister Theresa May, during which she also chose not to don a headscarf. It has been 10 years since a US First Lady last wore a hijab style scarf in Saudi Arabia. In 2007, Laura Bush was given a headscarf, which she chose to wear, by a Saudi doctor in Jiddah.